Davis 2017 planning is underway and the date has been set! Looking forward to seeing you all in April 2017! 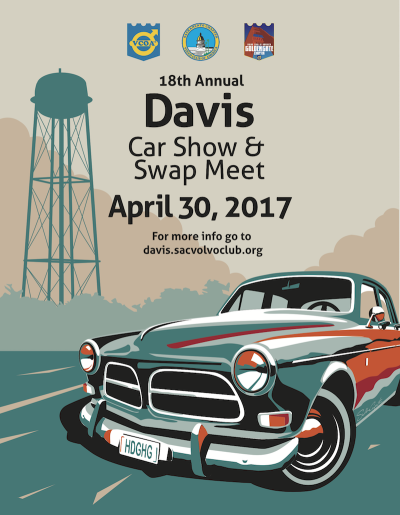 Hope you are well and looking forward to the 18th Annual Davis Meet Weekend on Saturday, April 29, 2017 - Sunday, April 30, 2017! The Davis Meet Weekend website has been updated with all the current event details! RSVPs are now open and close Tuesday, April 25, 2017. Registrations are now open and close Friday, April 28, 2017. 2017 marks the 90th Anniversary of Volvo! We would like to celebrate the occasion at the 18th Annual Davis Meet Weekend. And, we would love to hear your thoughts and ideas! Looking forward to seeing you at the 18th Annual Davis Meet Weekend in April! Last edited by volvie! ; 04-08-2017 at 10:06 PM. 2017 Davis Meet Weekend News, Important Dates, Updates, & Reminders! The 2017 Davis Meet Weekend is already breaking records! We have 23 sponsors supporting the weekend activities! Let's see how many records we can break this year! Let us know what interests you / how you can help! We've received word that a couple of the local hotels are fully booked for the weekend. As you plan your trip, if you have any tips or tricks you would like to share, please let us know! The last day to order is Sunday, April 16, 2017. Davis Meet Weekend Event T-Shirts available through Pre-Order. All shirts must be picked up at the show-- remember to bring your sales receipt! These events require require a head count / reservations. If you do not RSVP, we cannot guarantee that you will be able to participate in the Saturday activities you want. We will create a wait list after the Saturday RSVP deadline, to fill day-of-event openings on a first come, first served basis. If there is space available, we will confirm that in an e-mail to you, using the contact e-mail address that you provided. Pre-Registration closes Friday, April 28, 2017. Swap Spaces are by Pre-Registration only, and will be cut off when we're sold out, so register early. Car Show Spaces are by Pre-Registration or at the Entrance Gate. Interested in purchasing an Official Show Poster? We look forward to seeing you all on Saturday, April 29th and Sunday, April 30th! Just a friendly reminder that the 2017 Davis T-Shirt Pre-Sales close on Sunday, April 16, 2017! For ease of reference, all the 2017 Davis Meet Weekend: News, Important Dates, Updates, & Reminders that were sent out on April 8th can be found as a forum post above. We are aware of the issue and working on a solution. We hope to have this resolved as soon as possible and will update again as soon as it is resolved. And, your message will be forwarded to the proper person. Just a friendly reminder that the 2017 Davis Saturday A-La-Carte Event RSVPs close on Tuesday, April 25, 2017! We have a formal reservation for Karting (Event 4), with a maximum of 24 people. If we exceed that number, you may still be able to race on your own, but you will not be part of the VCOA group. This is due to available time slots at the facility. At this time we have 15 slots already spoken for. For ease of reference, all the 2017 Davis Meet Weekend: News, Important Dates, Updates, & Reminders that were sent out on April 8th can be found as a forum post earlier in this topic. Looking forward to seeing you all on April 29th and 30th! Just a friendly reminder that volunteers and photographers are needed! We especially need volunteers to help with parking and gate operations on Sunday morning from 7:30 a.m. until 10:30 a.m.
Plan on bringing your camera to 2017 Davis Meet Weekend and interested in sharing your photos? We would love to submit your photos for publication consideration to Rolling Magazine as well as display them on the Chapter websites / social media! Questions about how your photos will be used? Hope you are well and looking forward to the official start of the 2017 Davis Meet Weekend! We're now one week away! Just a friendly reminder that we are determining if there is interest in offering the show posters for sale, and if so, how many to print. Looking forward to seeing you April 29th & 30th! I've been in contact with Gary Lodge. The issue with PayPal not connecting when pre-registering for the 2017 Sunday Davis Car Show has now been fixed! Gary Lodge and Nels Berg are attempting to get in contact with everyone that pre-registered before the event via the e-mail address you entered in the registration form. The Sunday Davis Car Show registration forms were going through-- it is just a matter of arranging / coordinating payment. Depending on your preference, you can either pay via PayPal before the event, or at the gate on the day of the event. If you prefer to pay at the gate on the day of the event, your name will be added to a list at the gate. (Although you may also consider bringing your current receipt to confirm your pre-registration discount, just in case). I am bringing my Volvo to Davis, but it is a work-in-progress. Where is the non-exhibit parking? The Davis Car Show & Swap Meet welcomes all Volvo-bodied and Volvo-powered cars! You are more than welcome to register your work-in-progress Volvo in the show! Many unveil the progress of their restoration / modification projects at Davis and we would love to see yours, no matter what part of the process your project is in! You can participate in the car show with or without participating in the People's Choice Awards voting! There is limited street parking around Davis Central Park. Please arrive early and observe the posted parking regulations. We look forward to seeing you on April 29th and 30th! Hope you are well and looking forward to this Saturday and Sunday! We're now only a couple days away from the official start of the 2017 Davis Meet Weekend! 2017 Davis Meet Weekend News, Updates, & Reminders! -Two of our Northern California dealers will be bringing the new S90 and the new V90CC for all to see at Davis! -We have now sold all of our swap meet spaces, and there will be no day-of-show swap spaces available. Thanks to our swap meet sellers for a great response, we look forward to seeing you at the show! The routes have been tested and the event maps have been updated! Note: The route includes roads popular with cycling groups and is near busy hiking / running trails. Please be aware and share the road. If you previously saved an "All Events" Map to your mobile device, please double check that it updated! -If you have already paid online for your show registration, swap meet space, or a t-shirt, please bring your receipt with you to the show. -T-shirt orders will be available for pickup at the registration table from 9 a.m. until the close of the show. Please bring your payment receipt with you. A few t-shirts will be for sale in a limited range of sizes. We look forward to seeing you this Saturday and Sunday! Event Pre-Registration is now Closed! Please Register at the Entrance Gate! We look forward to seeing you all tomorrow and Sunday! Interested in sharing your photos and videos with the SacVCOA, GGVCOA, and/or submitting photos for publication consideration in Rolling Magazine? Have feedback, ideas, or suggestions for the 2018 Davis Meet Weekend Events? Interested in joining the team and contributing the the Event's success? Hope you are well and staying cool through this heat wave! The Sacramento and Golden Gate Chapters of the VCOA wish to thank everyone who contributed to the success of this year's show-- We could not have done it without you! Interested in sponsoring and/or volunteering for 2018 Davis Meet Weekend? We look forward to seeing you all for the 2018 Davis Meet Weekend!